What exactly does “mobile-ready” mean? The most common mobile solution is what I call a “pared-down” mobile website. This approach is currently being promoted by several of our competitors. With this solution, mobile visitors see a “pared-down” version of the website that is designed to accommodate a smaller screen and slower connection. This is accomplished, in part, by showing fewer pages (and less content on each page) than the standard version of the website. People looking for contact information: Our research showed that 95% of mobile visitors were looking for a phone number, street address, email address or directions. These people want immediate access to contact info without any fumbling. Returning visitors: These are people who have visited your site previously (via full-sized computer) and are coming back via mobile to get specific info. These visitors want to find information in the same place as they saw it last – even if it requires zooming and panning to view the content on a little screen. The “pared-down” mobile website approach doesn’t really address the needs of either of these types of users. When you visit www.greatjakes.com via mobile device, you are sent to the Mobile Splash Page, which is optimized for mobile devices. The splash page contains only vital contact information, including our physical address, phone number, link to Google maps and an email link. The splash page also contains a prominent link to “Visit Full Website.” This allows visitors to view our full, unedited, standard-sized website if they want detailed information about our company. Although reading the full-sized website on an iPhone might require some zooming and panning, all of the information is there – exactly where a return visitor would expect to find it. We’re still very early in the history of mobile computing, and mobile technology – and user behavior – is changing rapidly. 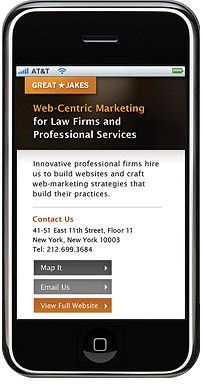 Who knows what will emerge as the best mobile website paradigm a year or two from now? We plan on watching these developments very closely. To view our mobile splash page, just visit www.greatjakes.com using your iPhone or other mobile device. Tell us what you think – we’d love to hear your thoughts. Thanks! This approach makes a lot of sense. One question: what about blogs? I see that the Great Jakes blog is optimized for mobile devices (which, interestingly, you didn’t mention anywhere in this post). Why did you apply different logic to your blog? Earl, that’s a good point. Our blog is, in fact, fully mobile-ready. We did this because we found that about 10% of our blog visits were coming from mobile devices (versus about 1% of our website traffic). FYI, most of the mobile visitors come to our blog via Twitter (to read a specific post that we tweeted about).